I keep reading pastebinit as pasteb-init, as if it was some sort of newfangled startup script spawned by systemd or something. 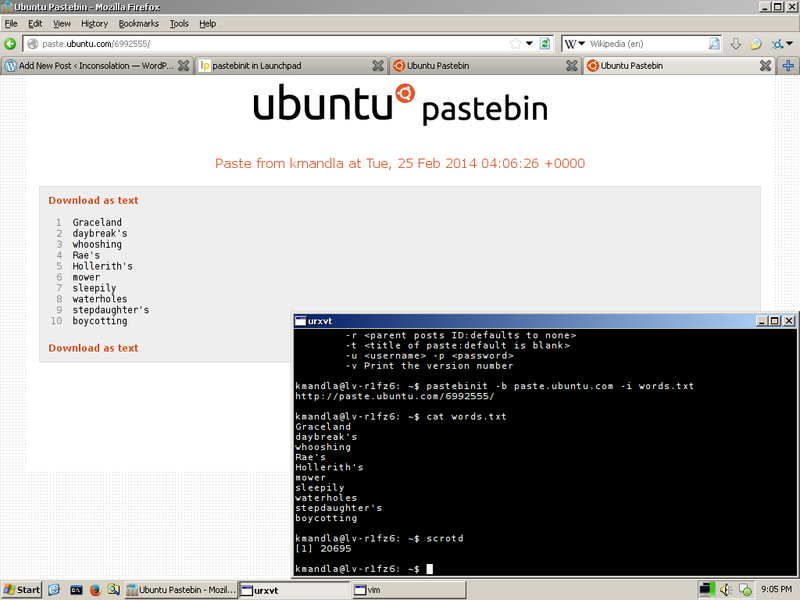 That, of course, is way off the mark, since pastebinit — as in “pastebin it!” is another cli-driven pastebin uploader. pastebinit is not the only such tool available, since we’ve seen haste, curlpaste, elmer and quite a few others in the past year. The usefulness of pastebinit or any of the others is more or less dependent on the pastebin you want to use. If pastebinit doesn’t mesh with your bin of choice … well, I guess that makes pastebin clients a little bit like instant messengers. pastebinit handles quite a few different target sites though, not the least of which is the one you see above. This entry was posted in Linux and tagged code, network, paste, pastebin, text, upload on 2014/02/24 by K.Mandla.